Moles refer to the occurrence of the clustering of skin cells. This cluster forms a flesh-colored bump at first. In time, the cluster changes color to a deeper shade of black or brown, due to over pigmentation. Moles are not normally harmful, but oddly shaped, discolored or new moles after adulthood should be examined by a licensed physician. Several home remedies to remove moles including using garlic. 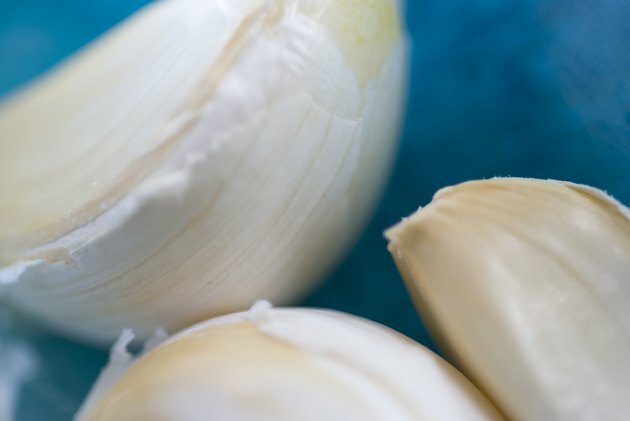 Garlic's enzymes break down cell clusters, causing them to spread out normally, also lightening pigmentation. Apply a thin layer of petroleum jelly around the mole onto the unaffected skin. You may also use masking tape to form a protective cover around the mole. Garlic extract will burn the skin, so protecting the skin is important. Crush one clove of garlic into a paste with a garlic press, and apply to the mole. Garlic extract may be substituted by applying it to the mole with a cotton ball or swab. This may be purchased at many health food stores or in the organic foods section of your local supermarket. Cover the treated mole with a bandage, leaving it on for four hours. After four hours, remove the bandage. Repeat the treatment process up to three times per day. Remove any used masking tape at night before bed to allow the skin to breathe and to keep it from drying out. Use this treatment method for two to four days. If you notice no signs of mole improvement, you may need to consult a physician. Never apply garlic extract directly to the skin. This may result in burns that require medical attention.